It is never too early to prepare for a spring garden. Whether you are planning your first garden or are an experienced gardener, fall and winter offer time for reflection and forming new habits. If you are making a new garden or bed, lay out some newspapers or cardboard now in the spot you wish to create the new garden. They will compost into the earth over the winter and prevent weeds from cropping up. 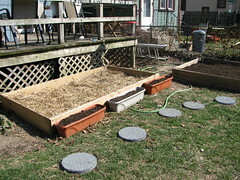 You can turn them under or build a raised bed right on top in the spring. Composting is a perfect activity to start in the fall. Build a simple bin and place it in an out of the way area in your yard. You could also start up a vermicomposting bin inside. Keep a bucket on your counter for vegetable scraps and get into the habit of collecting and dumping those in your compost regularly. Outside bins also need brown matter. Instead of subscribing to leaf collection, add those to your bin. You will be rewarded with black gold to add to your garden beds in the spring. Install or maintain a rain barrel. If you do not have a rain barrel, make plans for getting one. Our favorite local suppliers are the rain brothers. A barrel collects free rain water you can use to water your garden. If you already have a rain barrel, empty it near the first frost and turn it upside down to prevent burst from frozen water. Fall is a good time to reinforce the stand. Ask for garden tools, books, and accessories for holiday gifts. Very shortly I will be publishing a post about best gifts for gardeners and cooks. I just can't do it before Halloween. It isn't right to talk about xmas before Halloween. Read, measure, and plan. Visit your local library and extension service website to learn about something new. Measure your existing or perspective garden plot. Then, plan your spring garden! Some people like to write lists of what they will plant, others map it out on graph paper. Plangarden.com is a good resource for making an online printable plan. If you seek personal advice, I am offering garden consultations. Email rachelAThoundsinthekitchenDOTcom to schedule an appointment. Of course I will continue to provide pertinent posts on this blog as well. Rest. Enjoy the natural seasonal break that cold weather provides.